When the mercury rises, it is hard to remain a comfortable temperature inside without running up a huge bill. And that means frequent tenant complaints. Fortunately, the solution is much more affordable than investing in a new air conditioner or central air system. According to the American Lighting Association (ALA), installing a ceiling fan in each living space will help tenants feel cooler while saving energy. And if you have not upgraded your ceiling fans in the past eight years or so, you are missing out on saving even more money as many of today’s models are more efficient than ever. Joe Rey-Barreau, education consultant for the ALA and an associate professor at the University of Kentucky’s School of Interior Design, agrees. Ceiling fans have become popular in almost every room where people sit or stand for extended periods of time, he notes. 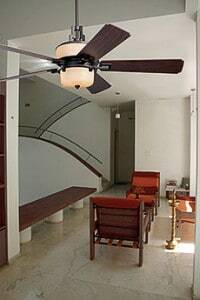 Another factor in determining where to install a ceiling fan is the fan’s UL listing. There are three basic UL-listed ratings for indoor, damp and wet locations. Fans that are rated only for indoors should not be used outside ” even if the area is mostly covered. Moisture and humidity can affect both the performance of the motor and the stability of the blades, Rey-Barreau explains, adding, Fans that are rated for damp locations can be used either indoors or outside in a setting where they are in a protected environment such as a porch. Wet-rated fans can be installed outdoors in situations where they will be in direct contact with water, such as in gazebos or mounted above a patio on the underside of a deck. The popularity of outdoor living environments has meant bringing along all of the amenities that make the inside so comfortable, Pirtle says. She suggests selecting a wet location-rated ceiling fan with a light kit to provide nice mood lighting when enjoying the outdoor area after dusk. With so much variety available, a consumer’s best option is to visit their local ALA-member lighting showroom. There, they will find trained professionals who can assess which type and size ceiling fan each room needs and suggest the most appropriate, energy-saving choice. To find out where your closest ALA-member lighting showroom is located, visit www.americanlightingassoc.com. The American Lighting Association is a trade association representing the lighting industry. Its membership includes lighting, fan and dimming control manufacturers, retail showrooms, sales representatives and lighting designers dedicated to providing the public with the proper application of quality residential lighting. For more information or to find an ALA-member retail showroom, go to www.americanlightingassoc.com.